OídioProt (MS) is a mixture of nutrients and growth factors that was developed for the microflora. Made of specific microorganisms that prevent fungal growth. The product is non-toxic and leaves no residues. It does not affect flowers or resin and does not stain the plant. EFFECTS. It aovids fungal attacks being highly effective against powdery mildew. OÍDIOPROT (MS) is a specific fungicide acting by contact. APPLICATIONS:. 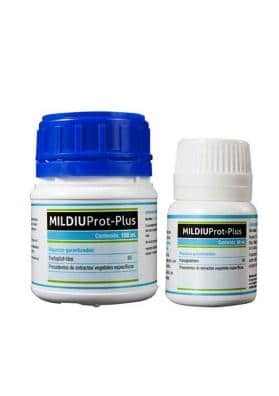 Used to control powdery mildew caused by several fungus like: Erysphe, Laveillula, Podosphaera , Shpaeroteca being suitable for outdoor, indoor and greenhouse cultivations. OÍDIOPROT (EM) acts by contact. For outdoor cultivation: two applications with 3-5 days intervals at a dose of 5g/L. Its continue application is recommended to continue for curative/preventive purposes. Use OÍDIOPROT (EM) every 10-15 days and stop applying it 10-12 days before the harvest since at that time it will be already biodegraded, depending on weather conditions (rain, etc.). For indoor and greenhouse cultivation: in case of serious attacks, make two applications of OÍDIOPROT (EM) with 6-7 days intervals at a dose of 5g/L. For very fragile plant (cuttings, seedlings ...) we recommended to reduce the dose to 4 g/L. After that, continue its application for curative/preventive purposes every 10-15 days depending on the gravity of powdery mildew attack. Stop applying OÌdioprot 15 days before the harvest since at that time it will be already biodegraded. DOSAGE: ​​To be optimized according to the gravity of powdery mildew attacks, nutritional status, etc. General dosage: 5g/L every 10-15 days. pH level: 7'5/8 aprox. Avoid applying this product in hours of high temperature and luminosity as it can burn the tender leaves. In a growing room, make sure the plant is dry before turning on the lamps.